There's a line from a Prefab Sprout song that says 'never criticise a man's choice of woman or his choice of work' - this should be extended to include saddles. When I got my most recent bike, I'd had a particular brand on its predecessor and I went for a similar, more expensive version for my Best Bike. I have done many, many hours on this saddle. Short journeys, long sportives, hill climbs, flat big-ring efforts - it's been not unbearable, but I have had periodic episodes of severe, shall we say, contact issues. I put it down to many factors - too much chamois cream, not enough chamois cream, padded undershorts washed too cold, too little padding, too much padding, various downstairs man complications, trapped hairs - it's not pleasant to think about, even for a bloke to whom toilet humour is a second language. After many changes to the rules of engagement, I thought it might be time to look at what I'd been stubbornly refusing to acknowledge for almost two years - perhaps the saddle was the problem. The RLt is a firm saddle but the curvature directs pressure through the sit bones rather than the perineal area. So, to the internet and the bewildering array of saddles available these days. Some perches have tricky cutaways to relieve the kind of pressure I was experiencing, others come with tried and tested "Pro Peloton" pedigree (some both); but my search for the most comfortable contact point seemed to lead consistently to one place: the innovative Rido RLt. Loads of people have done the legwork for me (pun intended), so I'll not bore you with a potted history of how and why this saddle came into existence. What attracted me to its design was that reviewers all raved about how comfortable it was, while the low weight (230g) and attractive design are a bonus. Still, once bitten, twice shy. I felt I couldn't commit to another two years of donkey-like denial that I'd made the wrong choice, so before buying I asked Rido for a tester saddle to try out on a sportive. For the meagre sum of £4 plus postage I was granted a week's use of said item. I had some reservations about this not being enough time to make up my mind - but my scepticism was ill-founded. Right from the first pedal push the RLt was a rather novel experience. I found all the pressure of my not-so-svelte frame was being directed through my sit bones and not to the narrow, more scarred areas towards my, ahem, centre of gravity. The Rido Rlt saddle has two areas of grippy covering under the pressure areas to keep you anchored in the best place to apply constant force to the pedals - no slipping about means no adjustment to your pedaling (or something like that). The RLt's unique design redirects pressure and is claimed to help riders maintain optimum pedalling position. An hour or so later I'd cycled and made adjustments and experienced a funny lack of pain or discomfort. Could this be the answer? Next day I took the saddle to Wycombe for a hilly three-hour sportive to test the manufacturers' claim that the design improves your climbing. Once again, I was impressed and pain-free after two hours, soaked to the skin and still impressed after three. The key aspect of the RLt is that the rear of the saddle, rather than being flat like most designs, features two raised mounds designed to cushion your sit bones and reduce pressure on the perineal area. The Rido website explains the science - for me, all the proof I needed was those first couple of test rides. So, I'd found my (bum's) true love and decided to purchase one permanently. I think Rido might be missing a trick in not offering a partial discount on saddles purchased following a trial, or at the very least, free postage when you buy one having tested it first. 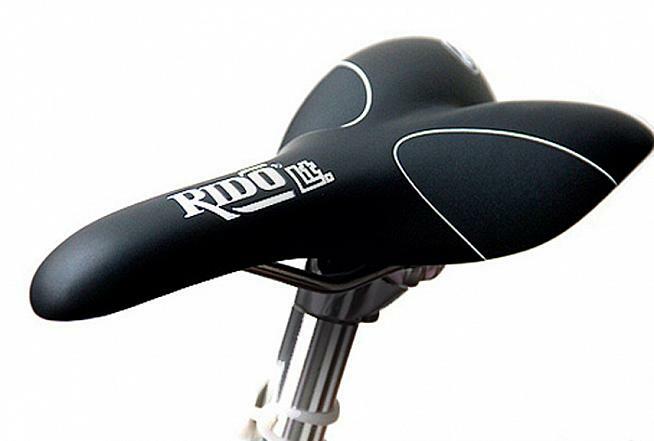 That said, there are very few places you can buy Rido saddles from at the moment, and there's always a lot to be said for buying direct from the manufacturer. In summary, the Rido RLt is a mighty fine saddle (for me) and I would thoroughly recommend it to anyone who is looking for a relatively lightweight and racy seat, without feeling like they're washing with wire wool and Harpic in the shower afterwards. The Rido RLt is available in three colours: Tour yellow white and black.